The only thing worse than seeing my retirement funds dwindle in recent weeks is to hear everyone and their uncle saying how important it is to save the souls residing on "the main street" - forgetting people like me who live couple of streets away from the Main Street. It is quite apparent now that if you don't blow up your money someone else will and I am quite capable of doing it myself. 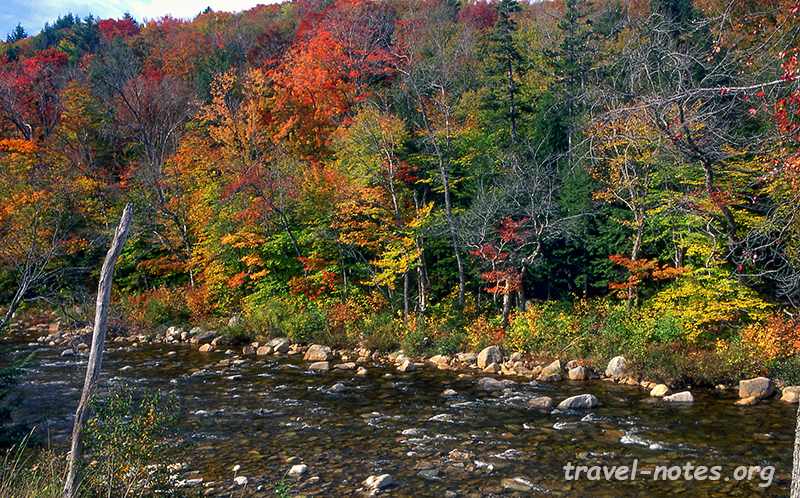 I could not find a better way to do that than to blow up a few thousands on a trip to New England to see coloured leaves. Internet search confirmed that first half of October would be the most rewarding and hence, the first half of October 2008 found me and my family driving aimlessly around the various main streets of the North East United States. This time around the baby joined us for the trip and to compensate for the uncertainty, I had drawn the whole trip out for 10 days - something younger-me might have done in 5. The first couple of days were spent getting the baby used to the time zone and covering the museums in Boston. The pick of these was the Peabody Museum in Harvard with its stunning glass flower collection - something I might have completely missed if not for extensive renovations at the Fine Arts Museum and Harvard art museums which put 90% of the respective collections rotting in some dingy cellar. After dodging the Boston traffic and figuring out how to get "theyah from heah" with non-existent road signs, I was glad to start our road trip and drive on the open country roads. The trip started off with a long eventless drive to Acadia National Park. The park scenic drive was mostly along the coast with views matching the best sections of the Pacific Coast Highway on the west coast. However, the real problem of the trip showed up on the park scenic drive when we painfully discovered that the little one has chronic motion sickness and has inherited my ability to puke-on-a-turn. I had to quickly re-work my "flawless" plan such that we now hit the scenic drives only when the baby dozes. The bright side of all this meant we would spend most of the day at the best view points on the scenic drive and skipping the rest instead of the usual stop-click-drive that we do trying to cover every single pull-over on the route. The latter usually ends up with us going through the trip pictures wondering where on earth were each of those taken! The best part of the following day was spent at the Rangeley Lake region of Maine. 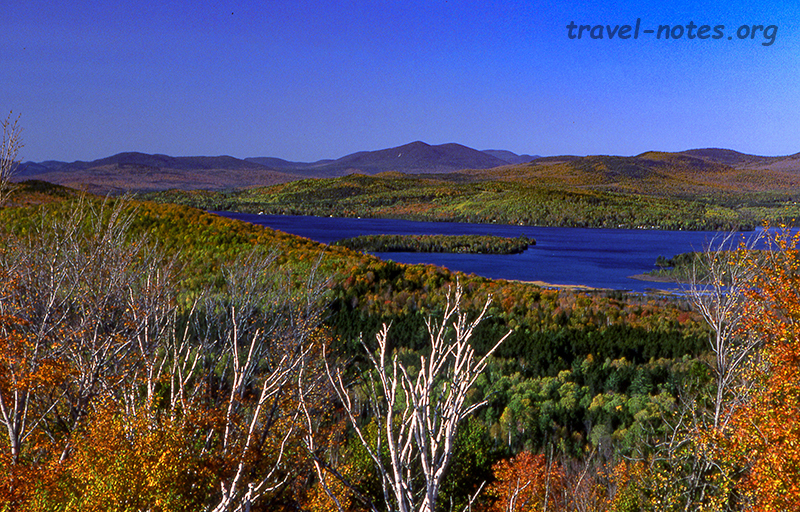 At the intersection of the Routes 4 and 17, there are some of the best sweeping vistas of the picturesque lakes of the region - Rangeley, Richardson, Cupsuptic and Mooselookmeguntic (no, I did not make the last one up - this is a real name!). After spending a relaxing night at the tourist town of Bethel, we were ready for the next day - our best day of the trip as far as scenery is concerned. 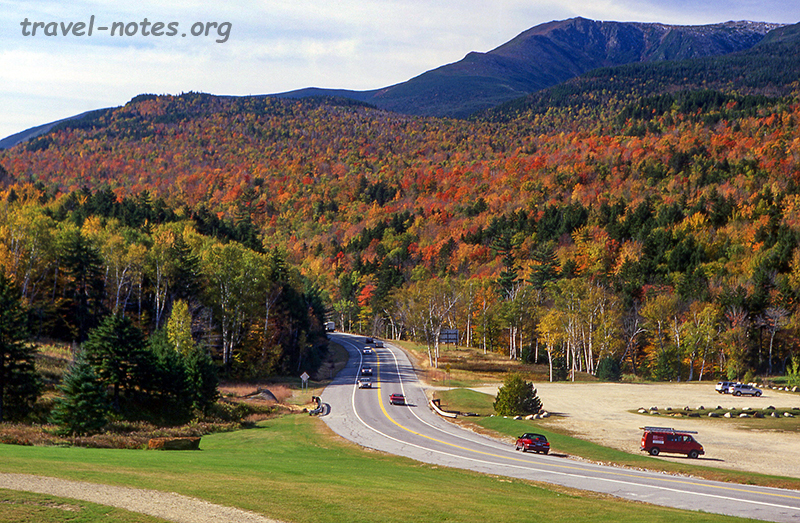 We spent the day driving on the two of the most scenic drives of the region - White Mountains Road (Route 16) and the famous Kancamagus (Route 112) through New Hampshire's White Mountains. For the first time we were greeted with the never ending array of rolling hills bursting out in all possible shades between golden yellow and crimson red. My only complaint for the day was our inability to squeeze in a 2 hour rubber-burning 16 mile return trip up the Mount Washington Auto-Road. It fell right at the time the baby wanted its feeding break. 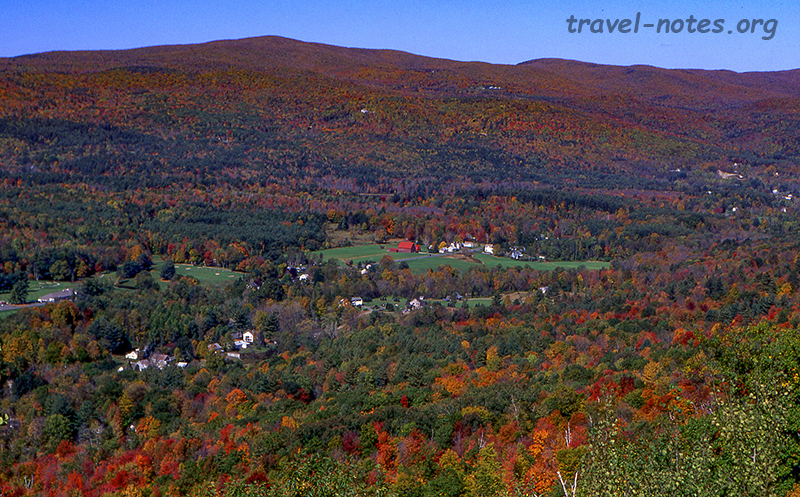 The following two days were spent driving down the spine of Vermont along the Vermont Route 100 which winds along the Green Mountains range. I have never seen such a long scenic route so utterly devoid of boring sections. Probably I should check back in another season when the hills aren't this resplendent! I was also glad that I chose to do this from North to South along the direction the colours were moving. The final drive of the trip was along the Mohawk Trail (MA Route 2) named after the trail used by the Mohawk tribe to travel from New York to the Boston coast. The most scenic hour of the route (section between Williamstown and Greenfield at the far left corner of the state) had views that matched or even bettered anything we saw on the trip. The view from the famous hairpin-bend and the 65 mile view point were easily the highlights of the drive. Finally after 8 days and 1000 miles on the road, our trip ended in the customary fashion - seeing the vacation land disappear from the (dis)comfort of an aeroplane seat. This time around, the sadness of the end was lessened by the comforting fact that we did manage to pull off a reasonable trip with an infant - giving me hope that my travel life may not die a premature death after all! As a final note, although I covered all the recommended main routes in the area, I didn't actually pass through any of the covered bridges that this region is famous for. All the bridges we passed by were a tourist-trap-detour from the main route - classic "bridges to nowhere"! Click here for more photos from Boston. 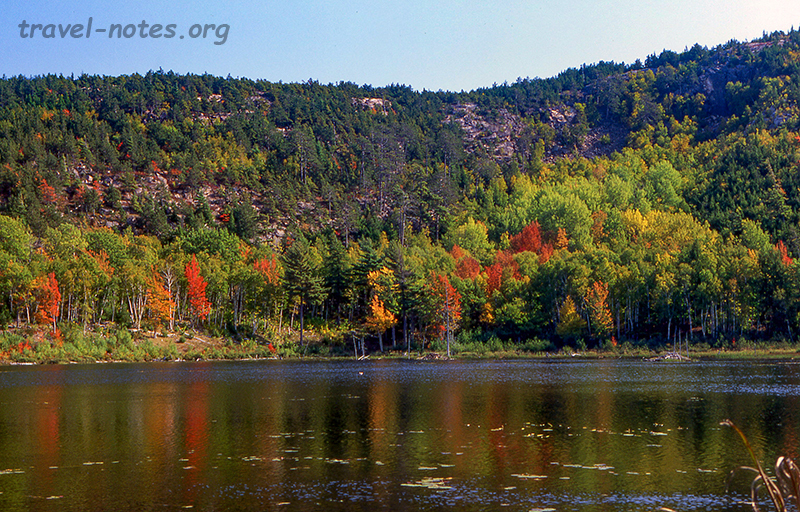 Click here for more photos from the New England scenic drives.